Home Automobiles Tesla’s AWD P85D revealed – Faster, more Autonomous and more Beautiful! Tesla’s AWD P85D revealed – Faster, more Autonomous and more Beautiful! Tesla’s all-wheel drive electric car, the P85D was revealed on October 9th at the Hawthorne Airport, and the beast displayed some stunning performance with some unbelievable features. Built on the platform of the remarkably successful Model S, the P85D is extraordinarily gorgeous and powerful. It all started with this Tweet on Oct 1 by Elon Musk, and we knew that something was about to pop up. Now, we understand that ‘D and something else’ meant ‘P85D’ and it is an all-wheel drive with two electric motors. ‘D’ in the P85D stands for ‘Dual Motor’. Musk described that driving the car will feel like “taking off from a carrier deck” and we are also sure that it could be one of Tesla’s best cars ever made, provided that it does not have even miniscule problems like the Model S.
Musk also announced earlier that Tesla will be producing 100,000 cars every year and this has been attracting investors resulting in the increase of the company’s stock. The dual motors power the front and the rear wheels independently and this boosts the car from 0-60 mph in 3.2 seconds. No one would have imagined an all-electric sedan to do that. Tesla also claims that the P85D will reach a top speed of 250 kmph which is 40 kmph higher than that of the Model S’s 210 kmph top speed. So yes, the Dual Motor system has really put in some impressive performance. Don’t miss the insane mode. On the other hand, the P85D also has many autonomous features. They are quite similar to the features of the Mercedes Benz 2025 Future Truck concept, but the best part is that you need not wait till 2025. The production will start in December for this model but we think it might take some time for it to come to the roads, since the Model S and the Model X will be concentrated on for more production. The P85D can be summoned with the help of a remote (although Musk mentioned it is only suitable for private places). Other autonomous systems include Autopilot and automatic parking systems. 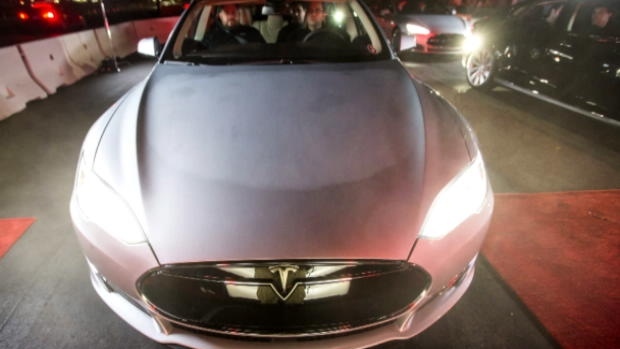 However, Musk also mentioned that it was not safe for the driver to ‘sleep off’ when the car was on autopilot. While other automobile enthusiasts and automation pioneers have been impressed by the car’s features, some of them have developed concerns about how these systems will perform under different climatic conditions and against all odds. But this video which was taken at the launch reveals how futuristic and brilliant the autonomous features of the P85 really are! Needless to say, the Tesla P85 is definitely a wonderful vehicle. Combining future technology and irresistible power, the P85 is definitely worth a drive. With the launch of the Lamborghini Asterion Hybrid and now the P85, we have witnessed that commercial electric cars are entering an entirely different segment, and in no time, they will evolve into high performance, highly practical cars for daily use. Tesla has really broken the barrier and changed the meaning of electric cars, living up to the reason why it was founded for!